I get it: You’ve read your fair share of online articles about B2B marketing strategies, haven’t you? And if I’m guessing right, most of those write-ups are generic—borderline useless. You can’t imagine why anyone would even take the time to write such a piece. Don’t worry. This article isn’t one of those. If you’re sick and tired of reading pointless articles about B2B marketing that trick you into reading them by claiming they’re “must-read guides,” then you’re in the right place. 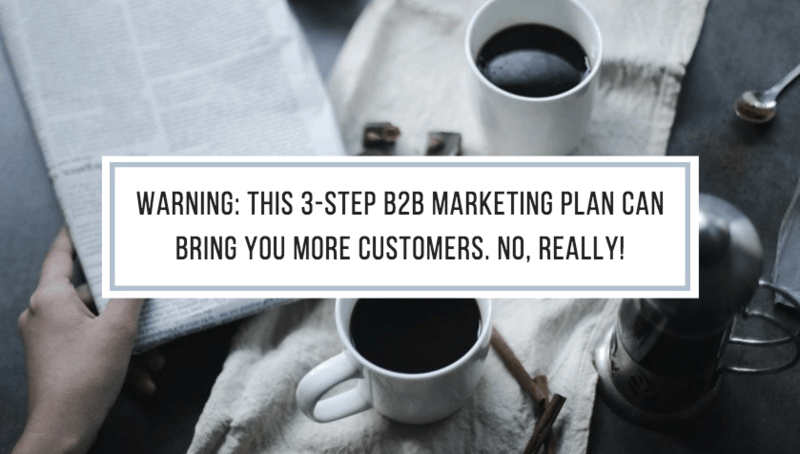 I’m going to share with you a 3-step B2B marketing strategy that you can use to grow your customer base. If you take the time to implement and use the steps detailed in this guide, I promise you’ll get positive results out of your marketing endeavors one way or the other. 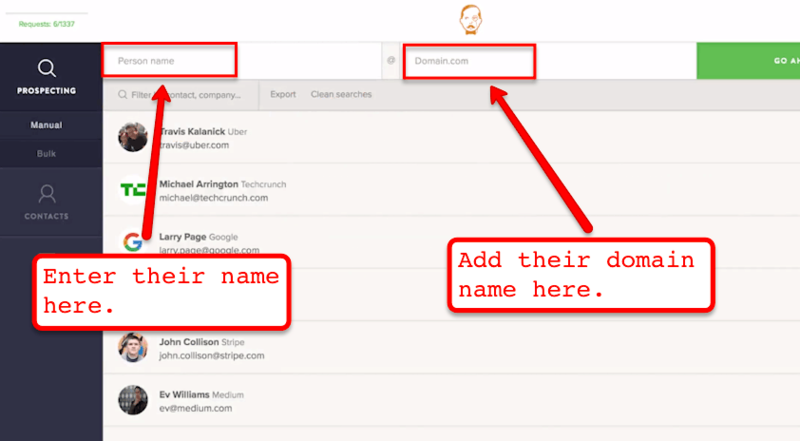 Step 1: Scrape data from directory sites to get leads. 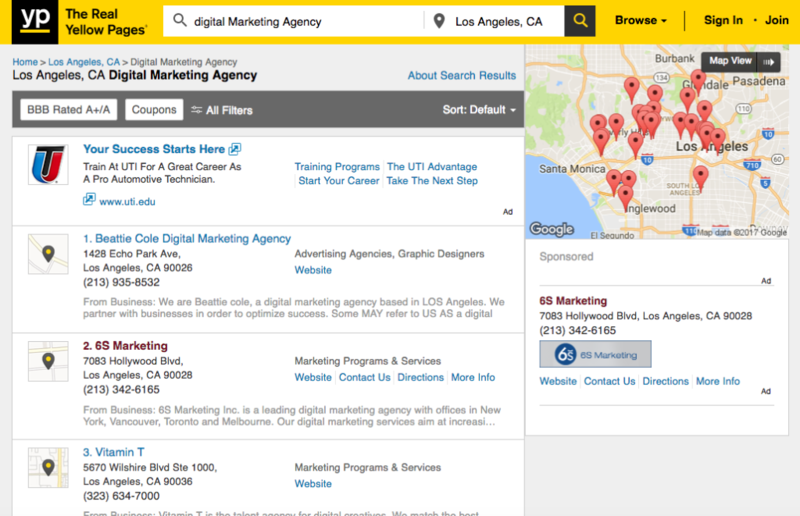 The YellowPages is the best thing since sliced bread for business owners and marketers who are looking for clients in a B2B setting. Not only does the website have bazillions of people visiting them on a monthly basis (Similarweb says they have about 40 to 50 million unique monthly visitors), but the platform also houses truckloads of businesses in their database. Allow me to show you a glimpse of what the platform has to offer. 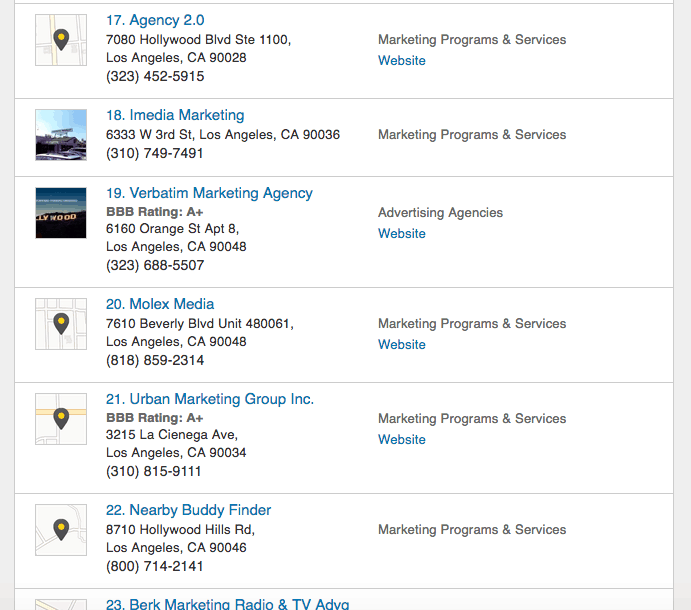 For the sake of example, I’ll look for digital marketing agencies in Los Angeles, CA. Here’s what you’ll see after you click YP’s search button. In the first page alone, I’m seeing 30 businesses listed. 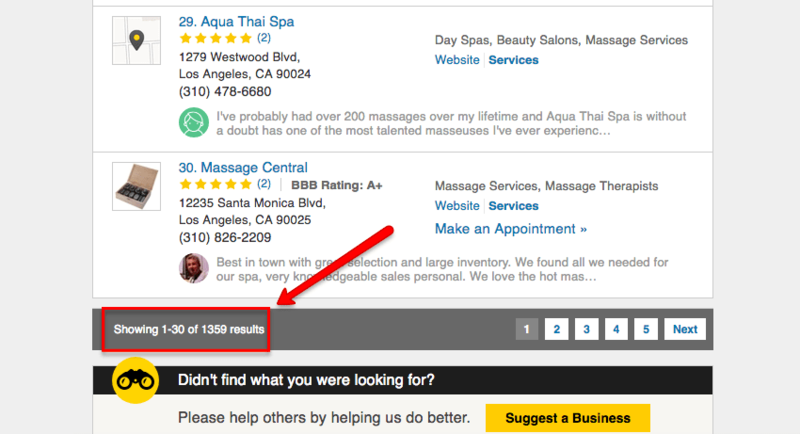 I tried entering another type of business (massage spa), and I still saw numerous results. While I doubt that all of the business listed are real (some of them are probably closed already), I’m sure you’ll agree that a good number of the businesses listed here are still alive and kicking. Now put all that info to good use. That being said, if you go to YP to scrape the website and contact information of your target business, you’ll be able to come up with a list of people to target real fast. Once you have your list ready, you can start sending outreach messages to business owners. Depending on your take on what B2B selling is all about, this might or might not be a good tactic for you to try. If you’re more comfortable with pure inbound marketing, as opposed to inbound mixed with outbound, then scraping the YellowPages and then reaching out cold is probably not a good fit for you. Just remember, there is more to scraping data from the internet than just using it to come up with a list of people to reach out to. The benefits of web scraping are far overreaching. Not only can you use web scraping to find leads, but you can also use it to study your competitors’ marketing strategies, get better insights on how people in your target audience are reacting to offers, or extract data from websites. At this point, you should already have a list of businesses you can reach out to. However, before you do that, I urge you to do step number 2 first. Step 2: Use Twitter to establish your personal brand. Before you reach out to others, especially to business owners, do what you need to do to have an established brand. With all the spammers on the internet, almost everyone tends to be wary of anyone who’s reaching out to them. If they do their research and see that the person who contacted them has little or no clout, then they would likely dismiss that person as a spammer. Therefore, they would ignore the person. Of course, you do not want to be ignored by the business owners whom you’ll reach out to. That would not do at all for your B2B marketing plan. After all, what good will the list that you’ve put together in step number 1 be if none of them will reply to your outreach message, right? Well, it’s a good thing there’s Twitter. Establishing your brand through Twitter is fairly simple to pull off, since there are Twitter automation tools that you can use to increase your Twitter following. There are a couple of nifty things that these automation tools can do for you. Narrow.io’s features allow you to follow and unfollow people automatically. It also “likes” other people’s posts if those posts have keywords that you added in your account settings. With these two features alone, you’ll be able to grow your Twitter followers (therefore establishing your brand, to some extent), without you having to spend countless hours on Twitter. You just need to set the Twitter automation tool once, and you’re pretty much ready to go. Step 3: Start your outreach. 2) An established enough brand as evidenced by your Twitter profile having thousands of followers. Now that you have these two points readied, it’s time for you to put your B2B marketing plan into action by reaching out to your list of prospects. There are several angles you can take when reaching out to your leads. You can either offer them freebies to get them to open up to you, you can straight up pitch your services on your first email (rarely should you do this), or you can contact them offering to collaborate with them on a project of some sort (among other things). Some guidelines for creating your outreach message. Because there’s no way I can predict which approach you’ll take, allow me to share with you some guidelines that you need to consider when creating your outreach messages. Talk about how the recipients can benefit from you. Not how awesome you are. Make sure that your message have these elements: a) How they can benefit from you, b) A short statement telling why they can trust you, and c) A clear statement telling them what exactly it is that you want them to do. When you have these points in your message, your chances of getting a reply drastically increase. Another tip I’d like to share with you is how you can use an automatic email finding tool to find a person’s email in a matter of seconds. VoilaNorbert is one such tool. 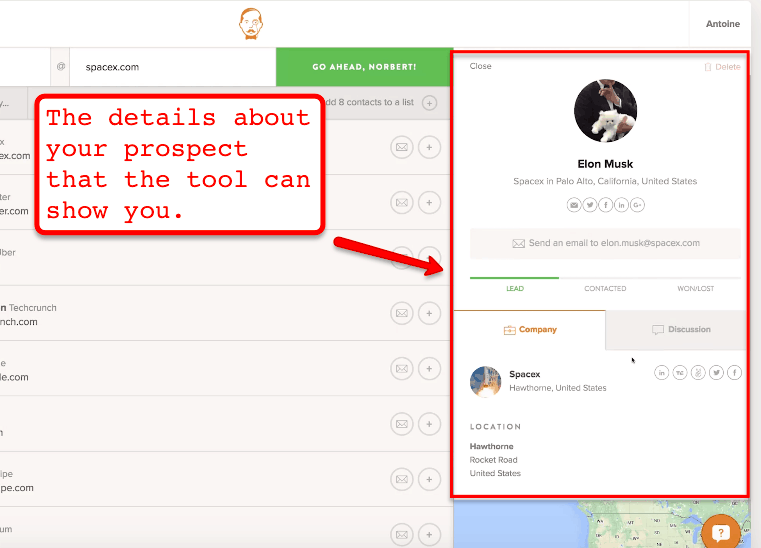 You have only to enter your prospect’s name and their domain name, and the tool will automatically find their email for you. Here’s what you’ll see when you click the green “Go Ahead, Norbert” button. When you have tools like these in your B2B marketing arsenal, you’ll be able to do your outreach twice as fast. Whether you’re pitching a guest post, straight up selling your services, or trying to build a strategic partnership with your prospects, you’ll get better results out of your outreach methods with the points above. What are some of the most straightforward yet highly effective B2B marketing strategies that you’ve used so far?